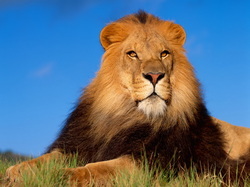 This is a male lion. They have a bushy, soft mane around their neck. 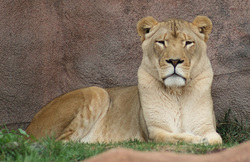 This is a female lion. They are the hunters. They do not have a mane. 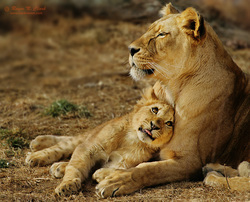 Lions belong to the cat family. Their cubs are very cute but you wouldn't want to keep them as a pet! 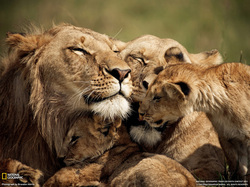 Just like you, a lion's family is very important to them. 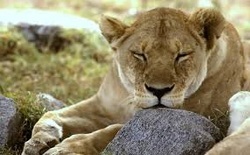 Lion's do not have any natural enemies. 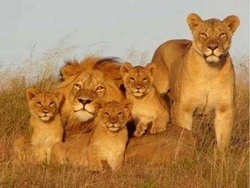 They are King of the Jungle! 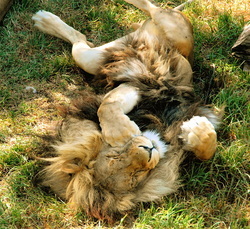 Lions use their color to hide in the grass or dirt. They have a smooth covering, just like a cat. What does a lion eat? Meat, lots of meat. They hunt for their food. 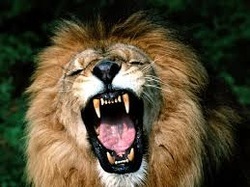 Just like a cat will catch mice with their claws, lions will catch their food with their sharp claws and use their big teeth to eat. 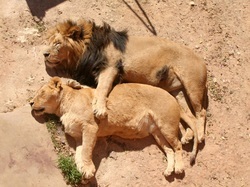 Lions spend much of the day napping in the shade. They do most of their hunting at night.